Unique geometric patterned bath rug with a multi dimensional pile. High quality, dense, very soft high pile 23mm / .91in rug. Purple: Really stunning design with three tones of purple. A very dark purple, medium tone and light purple with a slight hint of pink. Coordinated Lid Cover: Solid Purple - the medium purple tone in the rug design. 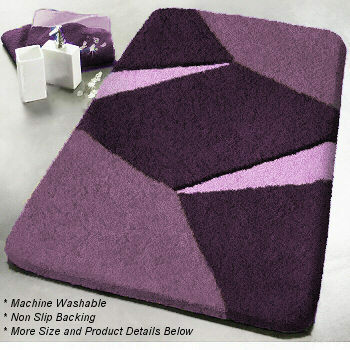 Ruby Red: Beautiful geometric bath rug with multi dimensional pile height. True red tones starting with a very dark red, bright ruby red and light red. Elongated lid cover for this bathroom rug design is a solid color.